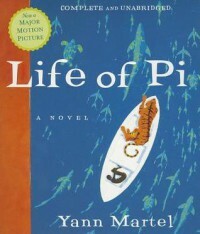 Life of Pi - DNF @ 20%. DNF @ 20%. This is nothing but lectures on zoology, Hinduism and Christianity. Not that this stuff isn't interesting, but a book with a good story it does not make. The weird interjections of the guy talking about some other guy are, well, weird. Frankly, this book sounds like it wants to be mega super Important, and it's not. The narrator reading Pi's chapters did a great job though, so props to him.